The list of spectra in SCOUT and CODE offered object types called ‘Angle scan’ and ‘XRR’ for a long time already. Although the names indicate what these objects are made for, there was no documentation up to now. We have started to update the SCOUT help with respect to these objects. Certain parameter combinations of Gervais oscillators may lead to unphysical optical constants (i.e. negative imaginary part of the dielectric function). Physical meaningful solutions satisfy a sum rule for the damping constants which may be used to steer the fit into the direction of ‘good’ solutions. The “check sum” (sum of the difference of LO damping and TO damping for all oscillators) can now be obtained as optical function. Use the optical function “my_material (Gervais_condition)” to retrieve the current value of the check sum. In order to make use of this number in a fit you can proceed like this(this hint will work in CODE only): Generate an integral quantity of type ‘function of int. quant.’ and call it ‘Gervais check sum’. As formula to compute the value use the term “of(1)” (here it is assumed that the check sum is the first optical function). So the integral quantity is the check sum itself. Now define a penalty shape function for this integral quantity. It should be 0 if the check sum is positive, and get large for large negative values of the check sum. An expression like “abs(y)*step(-y)y)” will do the job (in penalty shape functions for integral quantities the symbol “y” refers to the current value of the integral quantity). This way large negative values of the check sum are severely punished whereas positive values do not contribute to the fit deviation at all. Finally activate the option “Combine fit deviations of integral quantities and spectra” in the fit options dialog (File/Options/Fit). This lets CODE simultaneously minimize the difference of measured and simulated spectra and the fit deviation of the integral quantities (which is in this case the penalty for an unphysical check sum). Eventually you have to experiment a little bit with the weight of the ‘Gervais check sum’ in the list of integral quantities in order to get a good fit. Using several Gervais oscillators at the same time eventually caused numerical problems. This has been fixed today – you can now really use all 10 oscillators which are offered by the “Gervais dialog”. 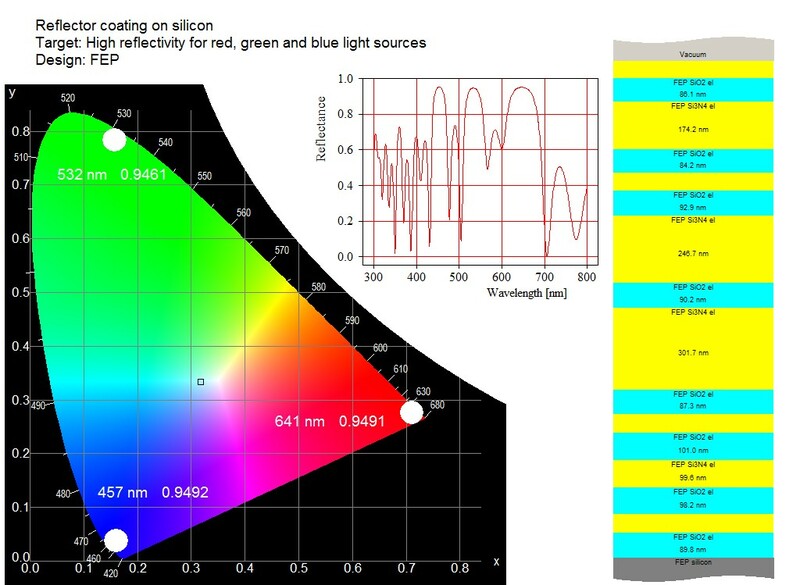 Reflectance spectra of the TohoSpec3100 system can now be imported both in SCOUT and CODE. You can now check-out a managed license for offline use. The typical scenario is that you plan to travel with your laptop and expect to have no internet connection for a while. In this situation you can use the menu command “?/Check out managed license for offline use” while you still have a connection to the internet. You have to specify the number of hours for which you will be offline. During this time you can work without connection to the license server. The license server blocks your license for the indicated offline time for other users. If your license is one license of a pool shared by several users act responsibly and declare reasonable offline periods only. If your offline time is over earlier than expected you can use the menu command “?/Un-do managed license check-out” to tell the server that you are online again. Your license will then be available for other users if you do not use if for some minutes. In order to realize some new user interface options in views, we have introduced some new script commands. The available commands are described here. A new version of live.exe is available here. The new version makes it very easy to migrate your software from one computer to another. Copy live.exe to your program directory (like c:\my_software\code\) and start it. Click on the button ‘Generate backup folder’ – the program lets you select a destination in your network and then backups the complete program folder and your application data, including your passport file. You should execute this backup function from time to time to save your software package. The destination folder should not be on the same drive as your original installation. In order to install the software on a new computer you must make the backup folder accessible for the new machine. Then start live.exe in the backup folder and click on ‘Install software on this computer’. This action will do the installation for you and your software should now run on the new PC. If your software is protected by a USB dongle you must install the dongle driver on the new machine first. The dongle driver is available here. If your software is protected by activation you need to obtain a new passport file from us. An import routine for tec5 textfiles has been implemented. The font for graphics and text in the main view was not always properly set after loading a configuration. This has been fixed. Visualizing a layer stack in views is now more flexible. Instead of representing each layer as a rectangle of constant height (i.e. the same height for all layers) the graph can now better visualize the proportions by drawing the rectangles with heights proportional to the thickness of the layer. The new kind of drawing is activated by a click on the layer stack in the view. You will be asked for the thickness that the height of the base rectangle should represent. The value must be specified in micrometers – if you set a value to 0.075 the base rectangle shows 75 nm of the stack. 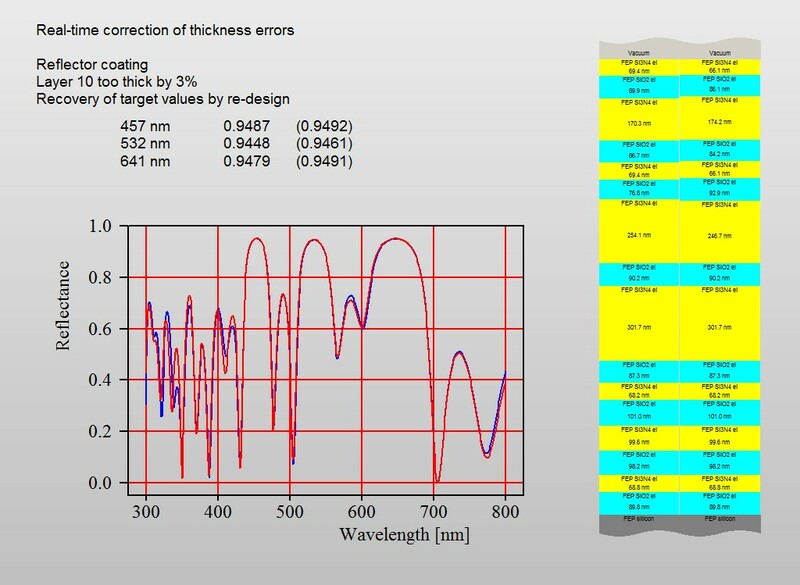 Since layer thickness values in stacks with thin films and (incoherent) thick layers are very different, it is not possible to see thick layers and thin films in one graph. Thin films with thicknesses 100000 times smaller than thick layers will simply not be visible (like in real life). If you still want to show the thin film part of the stack with the new feature you have to use 2 layer stacks: one for the thin film coating alone and the second one for the complete layer stack. In this case you have to insert the coating as ‘included layer stack’ in the second one.